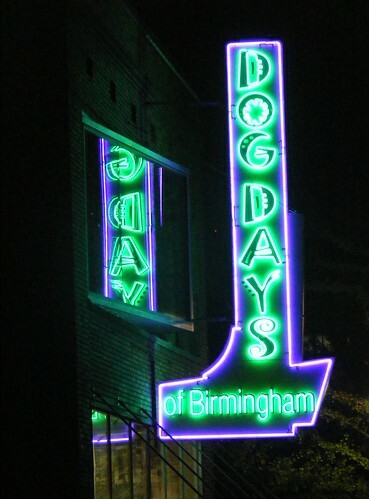 Neon in Birmingham: One for the dogs. As I start to venture out again into the streets of Birmingham, it’s interesting to see just what’s starting to happen its the city center. The Railroad Park‘s grand opening seems to have folks wanting to see what else will change what they’re used to seeing around town. That and the recent trip to Chicago – which I need to post about tomorrow morning – has helped recharge the batteries. There are signs beginning to appear everywhere that the city’s attitude could be in the midst of transforming – including this one to your left. The former home of Hunter Furniture on 18th Street between 1st and 2nd Avenues North has recently been converted into a doggy day care center – Dog Days of Birmingham to be exact – to hopefully tap into the needs of the 60% of downtown residents that responded to an Operation New Birmingham residential survey saying that they own dogs. The Birmingham News did a profile of the new business’ owners Jimmy and Sue Johnson back in April. The furniture store had closed down in November of 2009. The original neon sign was included in this photo series’ original run back in July 2006. They’ve also got additional information online via Twitter and Facebook. Please be patient as we update the Neon in Birmingham page over the next few days to include links to all of the posts that have been written about the city’s colorful glow.